Everyone wants to live life fully reaping all its benefits. Having time for each life profile: career, healthy lifestyle, family, hobbies, leisure life – is the main concern. How successful are you with ticking all the boxes on every profile every day? Do you manage to do what you have planned? Or there are still some bullet points you decided to skip for tomorrow? Time pressure. Speed of life. Tons of information. And we all need some quiet time to think as well. How do you cope? Moreover, how do you cope if you are responsible not only for your life profiles, but also for your subordinates, for business’ share. It is hard and not easy at all. Only a cool headed approach and a strict discipline will get you to the peak of this pyramid. Climb with well-thought strategy, otherwise you will fail quickly. There are only 24 hours. I know, for some of us it is not enough. But unfortunately, we have limits. Limits of our energy, limits of our resources and limits of our time. Let’s re-think your time share for each life profile. So, what is this cool-headed strategy that helps shrink the time scale and establishes new mindsets ? 2. Focus. Don’t get distracted, try to remember your priorities. 3. Stay Relevant. Select the information you receive, try to follow the one that will add up to your priority. 5. Re-think priorities in accordance with change of external factors, force-major issues. 6. Tailor your strategy accordingly and Do it fast. – Don’t loose time, if something went not as you planned. Don’t regret. Instead, switch fast, but remember to stay relevant. 7. Watch your achievements. Enjoy what you achieved, celebrate Life, before you set new goal. Otherwise, you will stuck in your routine, prioritising only one profile. It will not make you productive. On the contrary, you will become less creative, less energetic, and more stuck in a routine. It is obvious, you will not attain any results at the end. Recently I read very interesting post by Michael Hyatt, author of New York Times, Wall Street Journal, and USA Today bestseller “Platform: Get noticed in a Noisy world”. He pinpoints to the borderline between ‘abundance’ as a ‘blessing’ and ‘abundance’ as a ‘burden’. The ability to stay relevant and prioritize through selecting the more essential task – is the skill that establishes the borderline. If you are already quite successful, you will have lots of temptations, and their influx will increase every single day. Every single day you will receive lots of opportunities. But you need to select and say ‘no’, otherwise your health, your private time might be affected. Essentialism is the right word that might help us say ‘NO’. “There are far more activities and opportunities in the world than we have time and resources to invest in. And although many of them may be good, or even very good, the fact is that most are trivial and few are vital”. G. McKeown, Essentialism: the Disciplined Pursuit of Doing Less. As suggested by G. McKeown, by saying ‘no’ you are buying space for yourself, where you can find creative freedom. You save your energy for vital few, rather than spreading it for the tasks that do not add value to your life. G. McKeown underlines the social pressure we experience nowadays. He suggests that it is no more ‘information overload’, but ‘opinion overload’. We do not hear our inner voice any more, as we are bombarded with ‘external expertise’. We loose our unique identity in this hectic race, choosing everything as priority, trying to be everywhere at the same time. Use your power of choice to figure out what your lifestyle is at the moment and whether you would like to change your mindset to bring more quality to it. 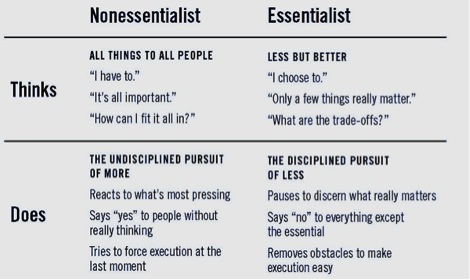 Below is the chart from the book on differences between the lifestyles of non-essentialist and essentialist. In the video interview for Stanford Business School, Greg McKeown answers the questions pivotal for successful leaders to breakthrough to the next level. He reveals that the main reason that impedes leaders to achieve that is success. Success becomes a catalyst for failure because it brings so many opportunities and options that diffuse the very focus that led to success in first place. Thus, we get to ‘Undisciplined Pursuit of More”. In order to overcome this hindrance we need to follow ‘disciplined pursuit of less’. We need to create a platform of effortless execution that will help us focus on ‘less’ but ‘better’. For that we need to start thinking and selecting only opportunities that are essential. It is possible only if we have our own space and we will develop a routine of daily ‘space’ that enables our thinking and selection process. McKeown emphasizes the importance of saying ‘NO’. Although most of the people try to avoid this practice, it is absolutely critical to say ‘no’ in order to gain some space for yourself. 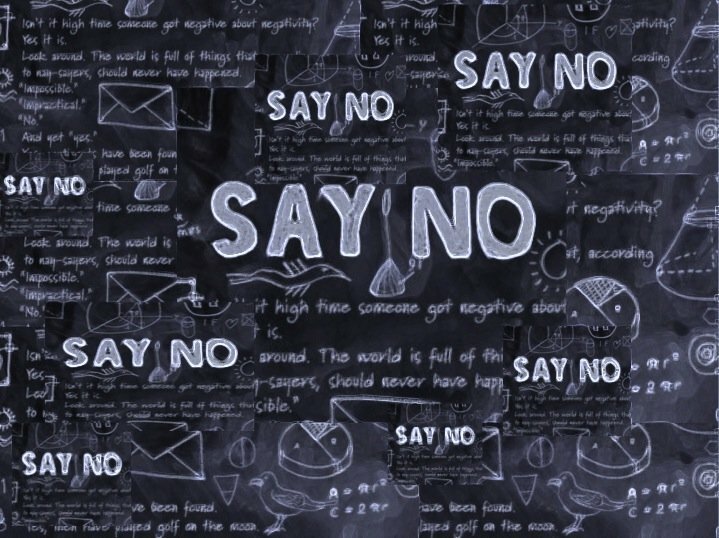 Leaders should develop a habit of saying ‘NO’ and say it gracefully, sensibly but unapologetically. 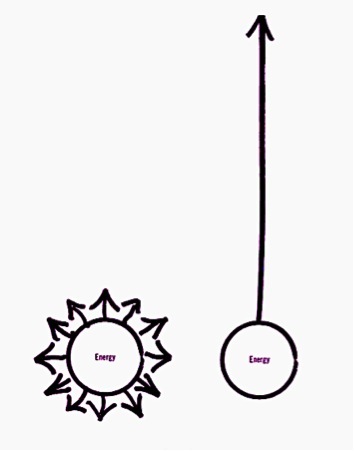 By being essentialist you stop wasting your energy and time for ‘undisciplined pursuit of Non-essential’ and your performance will boost as well as your success. Below is the video interview with Greg McKeown for Stanford Business School.